There are no catering facilities at Godmersham itself, however the nearby village of Chilham has plenty to offer. It's only 3 miles away, and takes 5 mins to drive and 45 mins to walk. 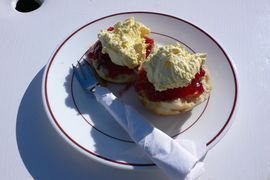 We recommend Shelly's Tearooms (nee The Copper Kettle) for an indulgent Afternoon Tea or slice of cake. There are also 2 public houses in Chilham. The Woolpack and The White Horse. We offer a small range of gifts at the Heritage Centre, from Jane Austen gifts such as bookmarks and bags, to books by local authors and postcards to send home. However should you need more country shopping, both Wye and Chilham (each 3-4 miles away) have a range of Gift Shops, General Stores & Post Offices. Godmersham Park is located in The North Downs Area of Outstanding Natural Beauty. From here you can walk towards Ashford or Canterbury, and through some amazing countryside. Try visiting Crundale, Chilham, Chartham, and Wye on foot. The Friends of King's Wood's Walk Number 2 takes you from Chilham Square (used in the BBC's Emma in 2009), along behind Godmersham House and back along Mountain Street, passing Chilham Lake (where a scene in Lovejoy was filmed). Whereas Walk 3 takes you along The North Downs Way, which forms the backbone of the Godmersham Park Estate, down in front of Godmersham House, along past the Heritage Centre, and onwards through Bilting, before turning you back onto the North Downs Way.